It's W.i.P. Wednesday again already! Dream Big is all done, though photos of front and back are being saved for Gen X Quilters' Summer Fair: A Quilt and Recipe Show. The show starts today, but due to W.i.P. Wednesday, I'll be waiting until tomorrow to post. Quilts and recipes - that's right up my alley! My Kaleidoscope quilt top is done and basted. I love how it is turning out! 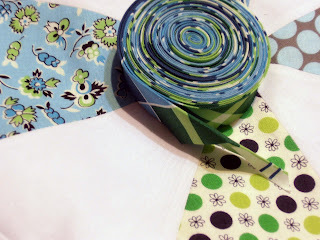 Last night I made the binding and quilting it is next on my agenda! 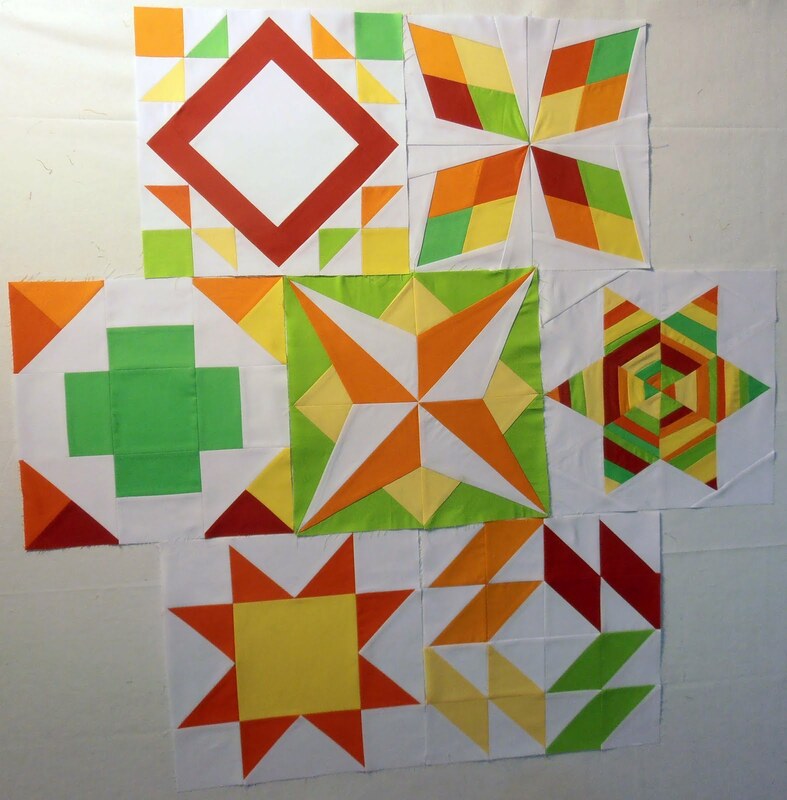 The Summer Sampler Series Quilt Along is along coming along nicely! I finished block #7. 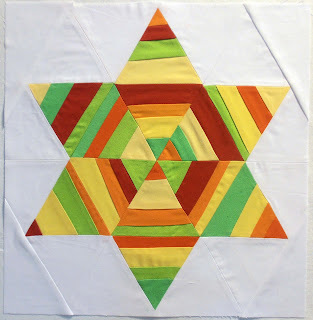 I loved the blocks on flickr that had each star triangle in a different print fabric, but considering I was working with solids, I went ahead and made the string block. 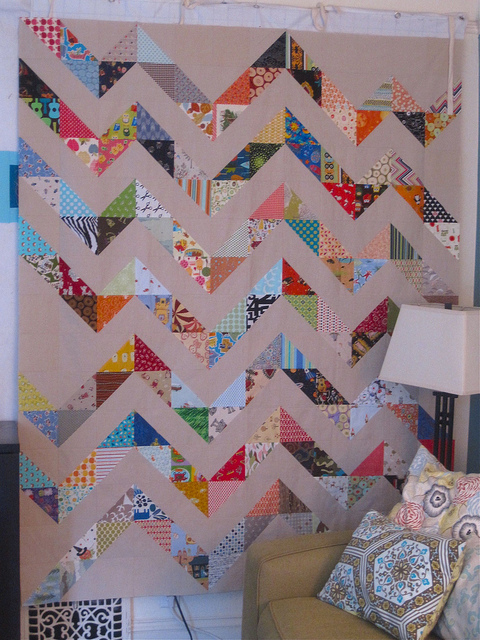 I really like how it turned out, and the pieced triangles were especially fun to make. Afternoon Snack table runner and Cappuccino Bali Pop "Light & Shadow" have been started, but not much progress has been made. Once Kaleidoscope is done, I'm planning on facing both of these projects before I get totally wrapped up in bee blocks and swaps. Be sure and head over to Freshly Pieced to see more W.i.P.s! They are so inspiring! Wow! Your Summer Sampler is looking so festive and yummy! Don't laugh but the colors make me think of Life Savers candy! In a good way! Love that star. Just gorgeous! Your so quick! That sampler has great color. Of course I can't wait to see the zig zag. Your Summer Sampler blocks are beautiful together! 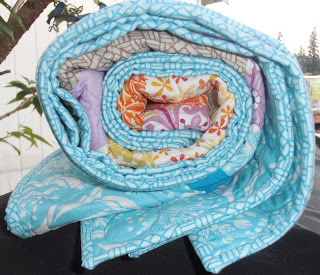 Love how you "style" your quilts. :) Your Summer Sampler blocks continue to look great - you are inspiring me to keep going. I can't wait to see that kaleidoscope binding! Cool!! I said it on flickr, but I love the colors of your Summer quilt. Your string star is so great. Love the colors for your summer blocks, they are perfect summer colors! Everything looks wonderful! How did you decide to quilt your Kaleidoscope and are you doing it yourself? Love your Summer Sampler Series Quilt Along blocks! I LOVE your Summer Sampler blocks!